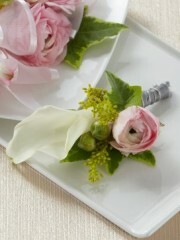 The Enchantment Boutonniere creates a beautiful overall look for your wedding party. 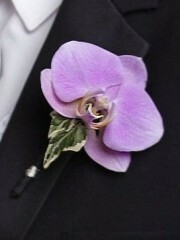 A single white mini calla lily and a pink ranunculus bloom are accented with variegated ivy and solidago tied together with a silver grey ribbon to create a wonderful complement to the style of your groomsmen. Approx. 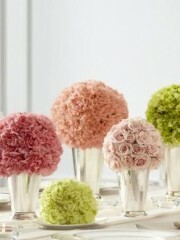 4"H x 2"W.
The Celebration of Love Arrangement blooms with the colours of happiness and grace to celebrate your wedding day. 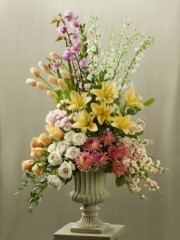 Peach tulips, white and peach roses, peach stocks, dark pink dahlias, white delphiniums, pink spray roses and flowerng branches, peach asiatic lilies and an assortment of fresh, lush greens are beautifully arranged in a resin urn. 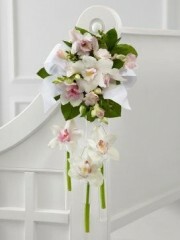 Create the ideal ambiance for your trip down the aisle with this fabulous pew end arrangement. 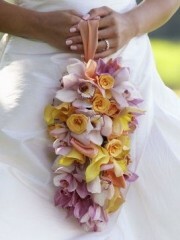 White and pink cymbidium orchids are brought together with dendrobium orchids and lush greens, accented with white taffeta and satin ribbons, to create an exceptional display of bridal elegance. Approx. 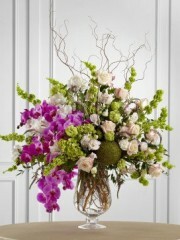 28"H x 13"W.
The Secret Garden Bouquet is what fairytale dreams are made of. 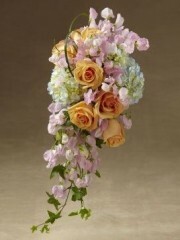 Pink sweet pea stems, orange roses and blue hydrangea are accented with lily grass blades and ivy vines to create a bouquet of enticing sweetness and grace. Approx. 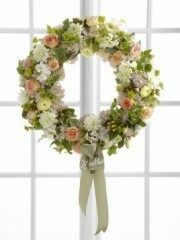 20"H x 10"W.
This elegant hair decoration is a wonderful look for you or your bridesmaids on your wedding day. 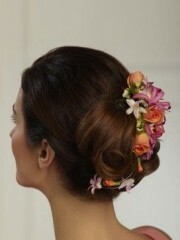 Orange spray roses, light pink hyacinth, pink nerine lilies, and green mini hydrangea are secured to an accent hair clip to give that extra touch to a French Twist or updo. Approx. 8"H x 3'W. 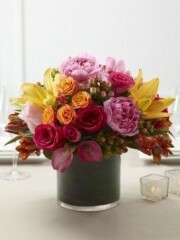 A truly beautiful arrangement of sophisticated simplicity. 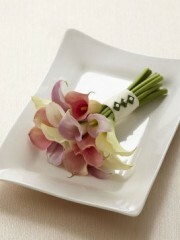 Cream, peach, and blush mini calla lilies are accented with lily grass blades perfectly tied together with an ivory taffeta ribbon. 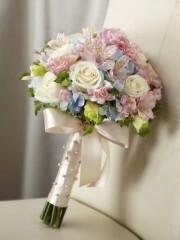 This bouquet is a stunning choice to carry as you walk down the aisle. 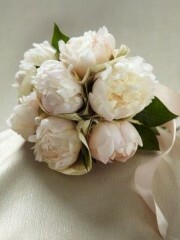 Blooming with sweet sentiments and endearing charm to get you to look your bridal best on your wedding day. 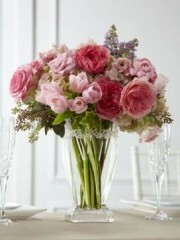 Stunning cream roses, pink mini carnations, pink alstroemeria, pink double lisianthus, blue hydrangea and bupleurum are brought together to create a picture-perfect bouquet. 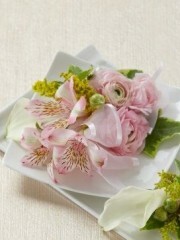 The Enchantment Corsage is a blushing representation of beauty. 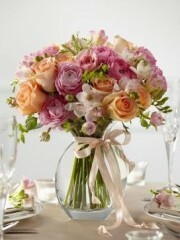 Pink ranunculus, pink alstroemeria and white mini calla lilies are accented with lush greens and a pink sheer ribbon to enchant at every turn. Approx. 5"H x 4"W.